If you haven’t heard of NUXEbefore, it won’t be long before you’re hearing about them all over the place. They have quietly been building up an international following of celebrities and beauty insiders for many years, garnering a cult status and very many fiercely loyal fans along the way. 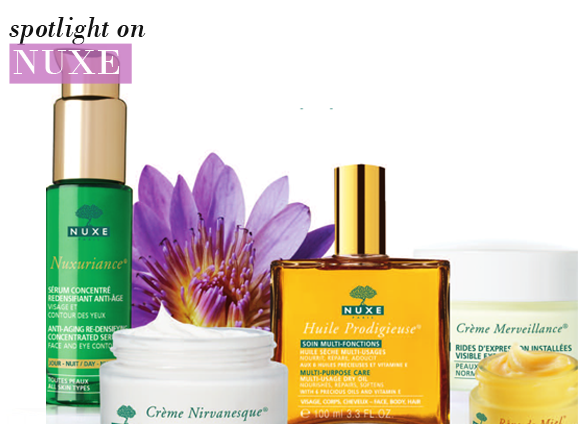 NUXE owes its success to its natural-origin cosmetics, born of the inestimable power of plants and its pharmaceutical expertise, a constantly innovative approach to natural products (the brand has an impressive 27 patents on botanical extracts) and proven effectiveness. awarded with the Most Innovative Laboratory in 2007 (INPI), the Merit for Natural Cosmetology Research Development (IIPP International Award 2008) and has numerous French and International Consumer Awards each year (already 2 “Voted Product of the Year” Awards). A unique combination of nature, performance and sensuality, NUXE offers a complete range of facial skincare .If you have combination or oily skin, then Aroma-Perfection® is your definitive range to mattify and control sebum levels. For intense moisturisation, try Crème Fraîche® de Beauté for your dehydrated skin, or for dull skin in need of radiance there is Étincelante®. Nuxe’s extensive anti-aging innovation extends into Nirvanesque® to help you to combat your first wrinkles, Merveillance® is the next stage in smoothing out your visible expression lines, Aroma-Vaillance® tackles deeper expression lines and a lack of firmless, whilst Nuxuriance® sets to work intensely redensifying aged skin, plumping it and making up for lost collagen levels. Other ranges include the Tonific® body care line, the multipurpose Prodigieux® products, and a family orientated range of ‘pure honey’ caring products named Rêve de Miel®. Nuxe’s star product is Huile Prodigieuse®, from £15.50, a multipurpose dry oil that is sold somewhere in the world every 9 seconds, and is used by enviable beauties Jennifer Lopez and Gwyneth Paltrow. Another is the family friendly Rêve de Miel® Lip Balm, £10, an intensely nourishing treatment for dry and damaged lips used by adults and children from 36 months. With one sold every minute, it’s easy to see how it’s a worldwide bestseller. This entry was posted on Wednesday, October 6th, 2010 at 3:36 pm and is filed under Brand Focus, Skincare. You can follow any responses to this entry through the RSS 2.0 feed. You can skip to the end and leave a response. Pinging is currently not allowed.